One of the driving ideas behind Wild Apricot software is to give small membership organizations greater power over their own data. It’s still very common for important bits of information to be stored in the filing cabinets, hard drives, and email accounts of volunteers -- one has the updated membership list, another has all the past event attendance records, a third has the newsletter template... and so on. As you probably know, it’s a big pain! Putting all this stuff together in one place is one of the biggest benefits of using a membership management system like Wild Apricot -- but just as important is getting it back out again. We’ve long included the ability to export data into other formats, such as Excel, Quickbooks, or PDF. 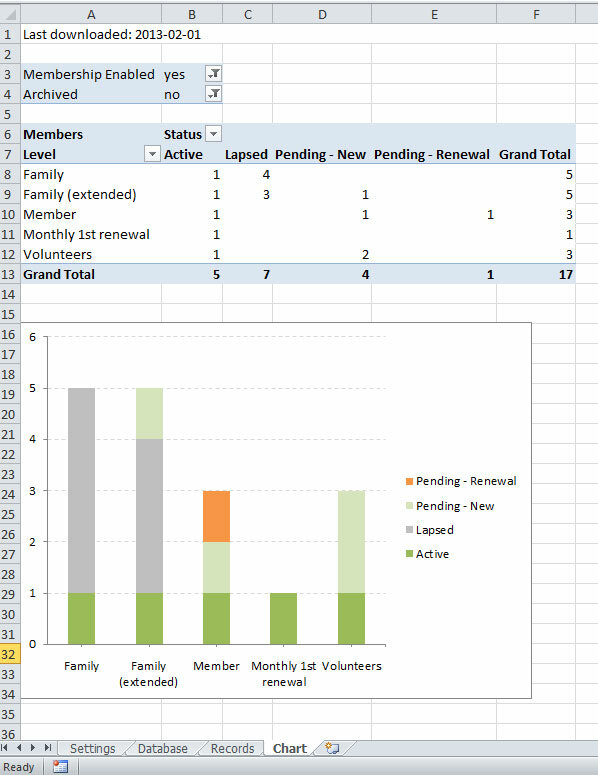 This lets you share and manage data in ways that Wild Apricot alone can’t, and allows volunteers and others to work with data in ways that make the most sense, for example using Excel to run certain kinds of reports or add figures. However, at the moment, exporting this information is a completely manual process. If you want to get data out of Wild Apricot, you need to log in, select what you need using our search tools, and export out into the appropriate format. This is okay, but it precludes a lot of automation that you might want to have in place for your organization. Before you get too excited, we should let you know that taking advantage of an API requires some fairly sophisticated programming expertise, so you might need to engage a third-party developer depending on your own knowledge and needs -- see our Partner Directory for some folks who may be able to help. To see how this might work for you and your organization, we will also be releasing -- along with the API -- an Excel spreadsheet that will allow you to download contact records directly from your Wild Apricot account without having to log in. The file will have a number of different tabs which let you specify which records you want to download and then work with the data you’ve downloaded it. 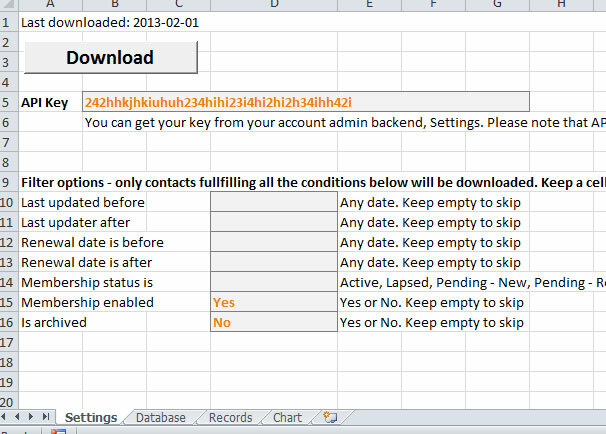 On this tab, you will provide your API key (obtainable within your Wild Apricot account) and then set some criteria to filter the records you wish to download - e.g.records that were updated between certain dates, records coming up for renewal within a date range, or records with different membership statuses. And if you want to use a different set of fields for filtering, you will be able to look at the sample code in the Excel file and modify it. Hopefully this gives you some sense of the potential uses of the API. This first version our API will provide read-only access to contact and member data. We will look at making event, donation, and other information available in future versions based on feedback. We haven’t made any plans for how we will expand this, so your comments are welcome. As mentioned, this API will be ‘read-only’, meaning you can only get information out of Wild Apricot. If you want to get data into Wild Apricot, you will still be able to do this through our importing feature, but for now it will not be automated. We want to take this first step to help understand how people might use this kind of data access, and of course we’ll be very interested in feedback as to how other data could be used. As always, we would appreciate your feedback via our community forums here. Version 1 of our API is currently scheduled to be released by end of summer 2013.